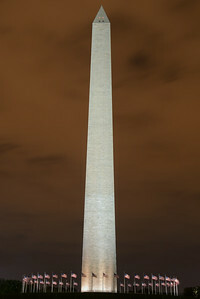 It has been awhile and I have been slacking on writing, So without further a due here are my pictures from a trip to Washington DC a month and a half ago. 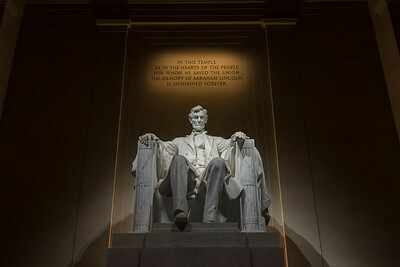 I was in Virginia for work and had an opportunity to sneak up to the nations capitol before memorial day to try and capture some shoots of the memorials. Fighting the Friday afternoon traffic I got to the hotel checked and and prepped my gear. 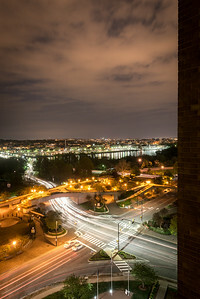 I only had that night to go out and shoot as the rest of the time would be spent with friends. By the time I was ready to go it was 1030 and I caught the metro from Roslyn to the National Mall stop on the Orange and blue lines. 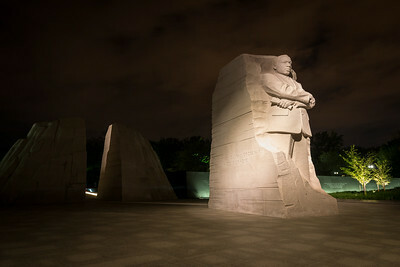 I was hoping because of the late hour there would be few people at the memorials. Well I was partly right. 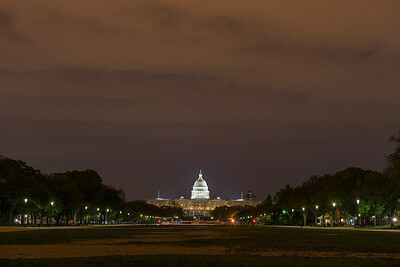 I started out taking shots of the Capital building from the Mall. To this day I am still amazed at the site of the rotunda, remembering the elaborate Memoirs that are painted on the underside I would point out while I gave tours of the capitol to constituents of Rep. Lynn Woolsey. 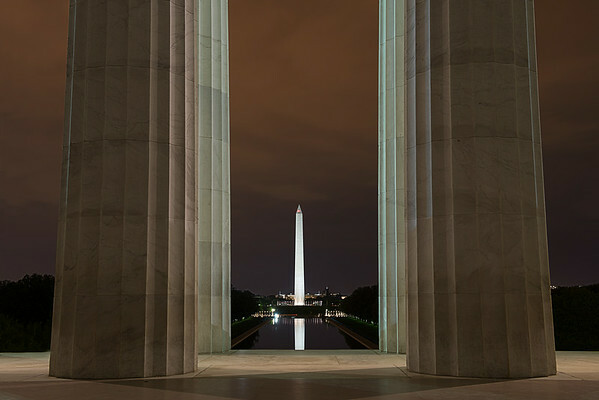 When I turned around I noticed that the monument was clear of the rafters that had plagued photographers in the DC area since the Earthquake the caused it to crack in 2010. 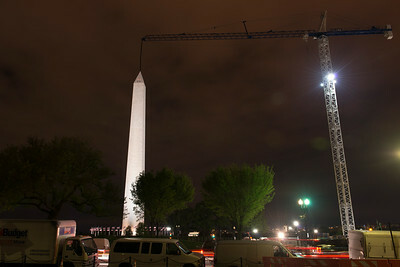 As I walked closer to it I composed the shot with crane above it knowing I would add the line in post production later. It was small personal joke I got a laugh out of. 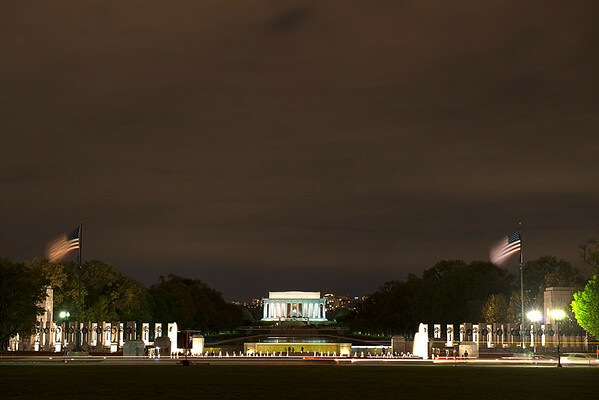 As I walked past the monument I stopped on the other side wishing I had a 70-200 to shoot through the WWII memorial to the Lincoln Memorial. 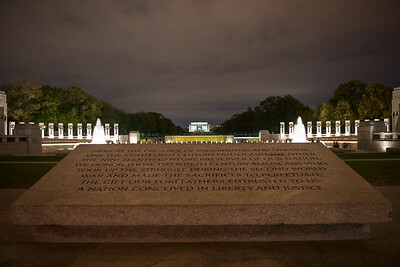 It is a an awesome view of a couple of my favorite memorials in DC. 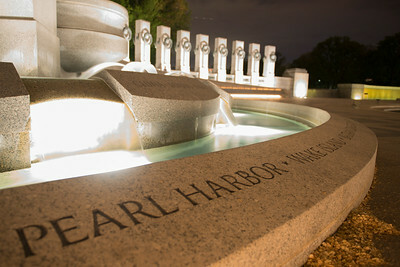 As I got to the WWII memorial I was still surprised at the amount of people still around. 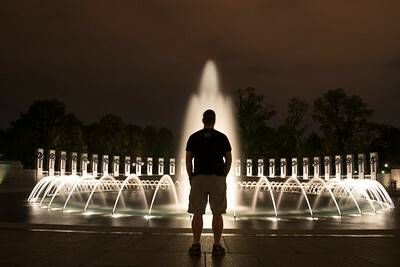 It took some timing but I got the shot of me in front of the fountain on the first attempt allowing me to move on to some other shots. As I worked my way through the WWII I looked at my clock and saw that it was midnight. 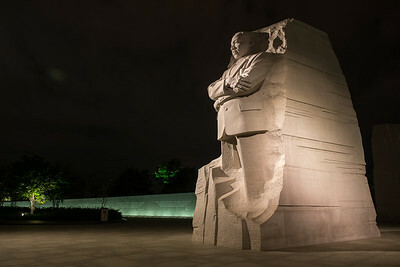 I decided to work my way towards the Martin Luther King Jr. Memorial. 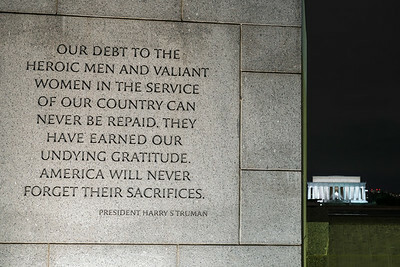 I had seen the Memorial right after it first opened and have pictures from before the controversial quote was removed from the left side of the statue. There were fewer people here and I was able to get in and compose my shoots pretty quickly. 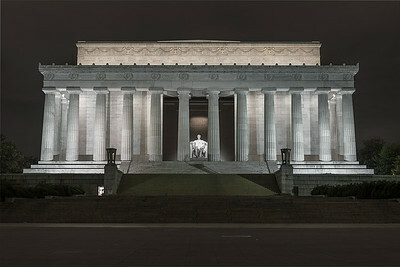 I could see the Jefferson Memorial and tried to compose some shots with it included. 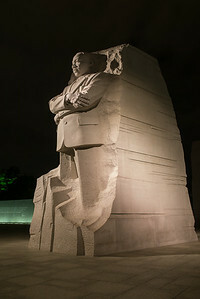 After the Martin Luther King Jr. Memorial I made my way to the Korean War Memorial. 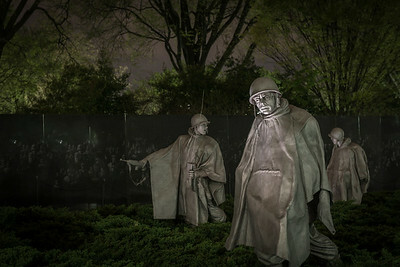 It is a very powerful memorial at night with the battle harden faces of the soldier statues purposefully lit giving a realistic feeling of both the sorrow and horror that these men faced. 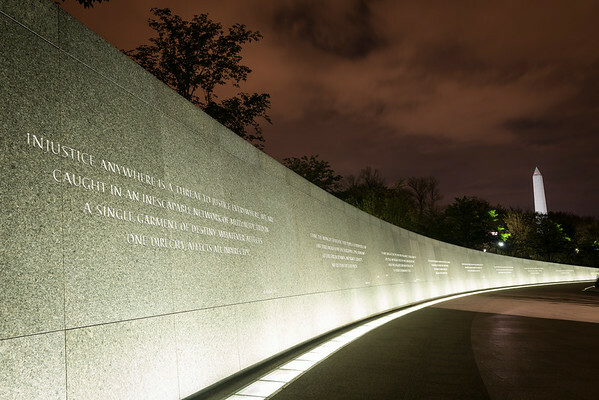 Having been to Korea and the Pacific Island I have seen the environment those men fought in and being at the memorial alone at night I could only imagine the conviction those men had to have to endure that environment. 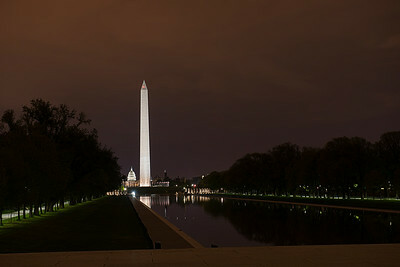 As I moved from the Korean War Memorial I made my way to the reflection pool as the lincoln memorial was still packed with people on Date night or Vacation. 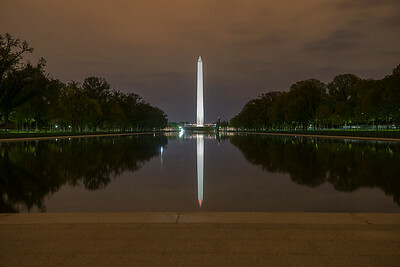 I took some shots of the reflection pool and was amazed that it was the first time I had been there and there was no wind, and the weather was a comfortable 75 degrees. 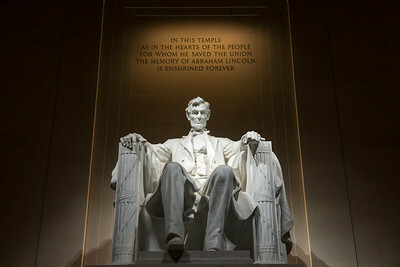 It was also almost 2 am and I couldn't believe the craziness at the Lincoln Memorial this late at night. 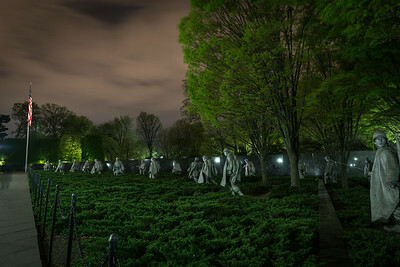 When I finally turned around I had to take 10 shots of the memorial without moving my camera or tripod so I could stack the images and remove the people that still littered the memorial so late at night in Photoshop. 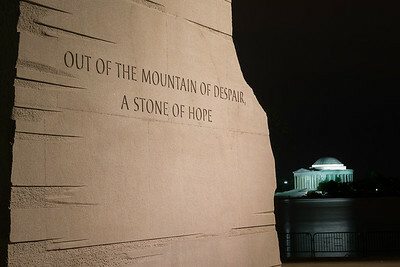 It was now past 2 and even though I stay up late there was one more memorial I needed to shoot with the void of people. 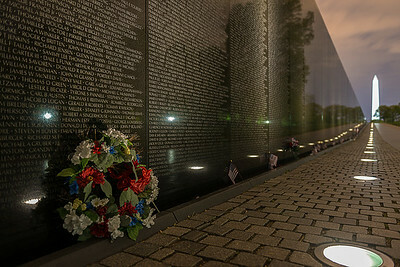 I made my way over to the Vietnam Memorial and made my way down the path of names. 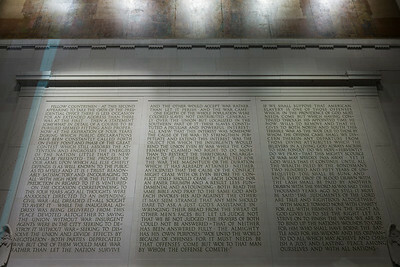 It is amazing at the shear amount of names on the wall. As I made my way down I read a few and took a moment to reflect on some of the friends I had lost in Afghanistan and Iraq. The power and influence of realizing that war stats are more than numbers, but that they have a name, a face, friends, family and lives that are all affected by their loss. 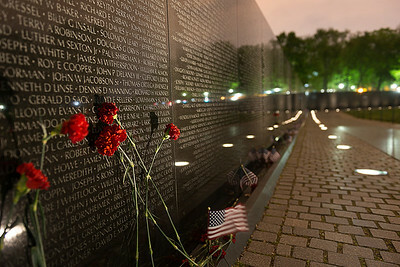 When I look at these great memorials I want to capture the powerful feeling of gratitude towards these men and women. In their Sacrifice we are about to enjoy the lives we have today.